Blogsdna.com is happy to have a copy of Image Tricks Pro ($19.95) for Mac OS X to giveaway to one lucky Blogsdna reader. Rules for the giveaway are posted below. Good luck! Image Tricks uses Mac OS X Core Image filters and Quartz Compositions to provide you with the ability to powerfully transform and edit your photos and images. Whether you are interested print materials, business cards, web design, or abstract art, Image Tricks will allow you to do everything from adjust colors to applying effects such as mosaics, crystallize, and halftone effects. 1. Follow us (@blogsdna) on Twitter or Become Fan on BlogsDNA Facebook fan page. 2. Tweet about this Giveaway on Twitter or Share it on Facebook. 3. Leave comment below with valid email address (without this your entry wont be counted). The giveaway is open till 30th December & winner will be announced on 31st December, so start participating today. Good luck! 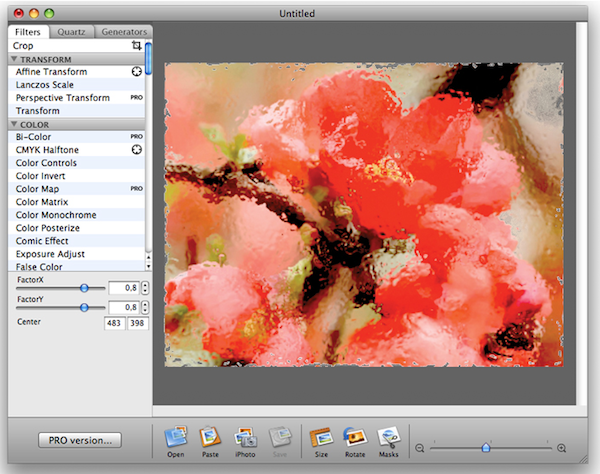 77 Core Image Effects and Filters (95 in Pro version). 35 Quartz Compositions (40 inPro version). 13 image generators (20 inPro version). About 100 unique masks can be applied to an image. Import over 20 image formats (TIFF, JPEG, GIF, PDF, EPS among them). Export to TIFF, JPEG, PDF, PNG and GIF formats. System Requirements: Mac OS X 10.5.8 or later. Hey Raju.. please leave a valid email address below. Winner will be announced on the 31st. Thanks. hey…. who is the winner????? Congratulations Anirudhanand you are the winner of our Image Tricks ($19.95) for Mac software license giveaway. You will receive further details via email. Congratulations Anirudhanand!! You are the winner of BlogsDNA.com’s Image Tricks ($19.95) for Mac software license giveaway. You will receive further details via email. Thanks.